The Baptist Union of Zambia (BUZ) has refuted claims circulating on social media that it had invited Honorable Harry Kalaba to grace the general conference which was held over the weekend at Ibenga Secondary School in Mpongwe district on the Copperbelt Province. BUZ President, Roswell Chinyakasa said the union only extended an invitation to President Edgar Lungu who could not make it due to other national engagements and not honorable Kalaba. Rev. Chinyakasa noted that the union is disappointed that honorable Kaluba has even gone further issuing statements on social media that he sent 36 pastors to reaffirm the invitation. He further stated that the statement is misleading in that the union did not make any invitation to honorable Kaluba be it in written or verbally. Rev. Chinyakasa said the church does not want to be drawn in any political agenda but to remain relevant to the call of preaching the gospel and promoting peace in the country. He has since called on honorable Kalaba to immediately withdrawal his statement adding that, the church believes in working with the government of the day. Kalaba , what proff do you have that you were invited ? And LT why are you not reporting that kalaba was evicted from the gathering ? This Baptist is deceiving, they say they never invited Harry Kaluba, but Harry Kalaba. The boy isbetter than u5 6Tim es straight loser tribalist. Get it straight. He will never rule Zambia. OOOH! HE LOOKS LOST NOW DOESN’T HE? SO VERY LOST. Wow now that is rude. Couldn’t the church have kept quiet than pushing this to the public? Denied in public, reduced to a commoner. But he is still the honorable in the house. Ooh, how he got it wrong! Harry Kalaba is a citizen of Zambia and is free to aspire. I cannot oppose or stop a citizen from practising a right that comes with citizenship. It is very unfortunate if Kalaba has gone into lying as well to gain political mileage but I still believe there was nothing wrong with him attending the event ….and that is why the last paragraph has wrong insinuations when a church leader says he believes in working with the government of the day ….are u then saying you cannot invite opposition or pray with key opposition members ??? spaka like lilo, i thought by now you should have know that LT tries to be as authentic as possible. they will only report information from genuine sources. so if you want the unfounded story about evicting Hk from the church go to ZWD and others with less truth. LT or Baptists who is giving wrong information? We all know Harry Kalaba. so Kaluba???? Ba Kalaba muleyisebanafe. I personally used to think you were above such nonsense. If the Association did not invite him, then what is wrong for him to attend the conference? Does it mean opposition politicians are not welcome in the Baptist churches since the church only works with the govt of the day? I feel for the upndeads. It’s rough being opposition where the top leadership are lost in the political hay, the chimbwis with no plan. Let all the hidden corrupt elements be bought off from upnd, so that high caliber people with leadership equalities remain. Let all the chaff be swept away by the good Samaritan sota that by the time upnd is in power there won’t be any corruption. As usual they will just brush aside such as in any case we were just about to expel that group. So kalaba needs to come out and clarify. This is an integrity test. BUZ President, Roswell Chinyakasa is behaving like a PF cadre! Why behave like Simon Peter who denied knowing Jesus 3 times because Lungu will not live forever and you will be left exposed when Kalaba becomes president. For a Church, I would never have expected Chinyakasa to be dancing to Dununa reverse for Lungu. So only Lungu qualifies to be the Guest of honour for your PF politically compromised stupid church. Foolish man. Those who become presidents are ordinary people like ourselves but it’s not ordinary to become president. Shouting insults and innuendos does not necessarily mean one can make it. Examples given Levy, Rupiah and Edgar are all “surprise ” presidents. …they never planned let alone aspire for office. 99% of those who aspired for this office never make it. Kalaba thought shouting corruption would make him a top ten HIT. 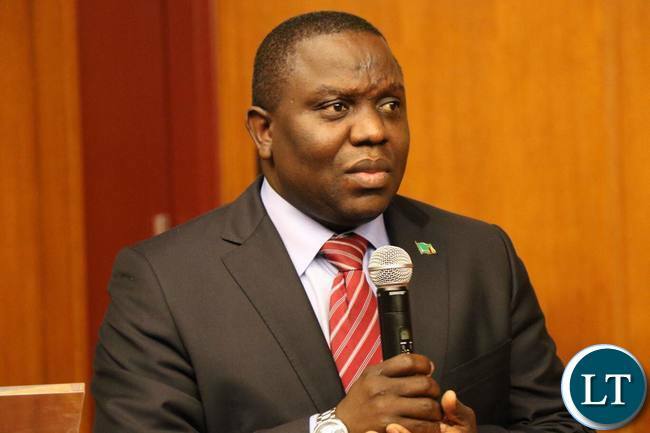 Kalaba resigned of his own free will after seeing the theiving and corruption going on with lungu and his gang…..he seems a man of integrity and could not reconcile himself eating with these theives while the masses suffer…..kalaba is probably one of the only ministers to pay back the illigal salarires earned campaigning for lungu , as ordered by the courts. And what makes you think Kalaba is clean and that others are not? Problem with you bantustanists is that who ever differs with Lungu suddenly becomes clean. If we’re to retrieve your posts about Kalaba before he left government we shall find that you called him scarface the thief. The guy was just a teacher but how come he’s got so much money that he can traverse the country at will and frequently. Kalaba hasn’t paid back that money. And why hasn’t resigned from the party of thieves? What would you say if Jack Mwiimbu joined PF but refuses to surrender the parliamentary seat he holds under Upnd? I’m sure your tone would be different from the one you’re using in favor of Kalaba. And I dare you to pull any of my posts I called kalaba scare face , never. Kalaba has paid back that money owed , stop being bitter towards the man for calling corruption as corruption. Spaka why should I be bitter against Kalaba? You’re sidestepping pertinent questions such as why he can’t leave a corrupt party and goes to form another political party. My grandfather comes from the same area as Kalaba and if I am not mistaken his mother could have been my primary school teacher so how can I hate my tribesman. But half honesty is not honesty at all.